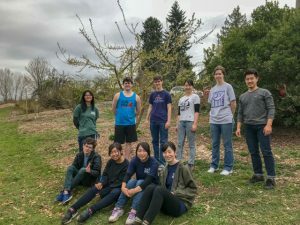 The Meadowbrook community welcomed Willamette University Take-a-Break Spring program to the Meadowbrook Orchard. 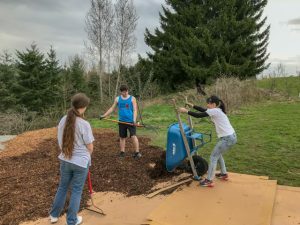 The service day was the fifth year that the program has visited the Seattle Parks site. 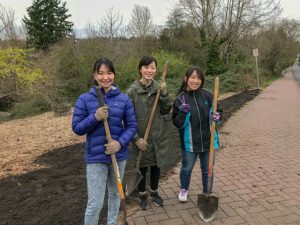 This year, the student group focused on improving soil conditions in the East Orchard and raising the ground level at the North Orchard trail head to help alleviate very wet ground conditions. The students week long focus looked at the Seattle area’s effort at combating homelessness. Visiting such programs as ‘FareStart’ was an example of the kind of focus the students took in. ‘FareStart’ is an entry level food service/industry program to prepare folks leaving homelessness can participate in. Having the students reside at the Maple Leaf Lutheran Church in Meadowbrook also gave them the opportunity to engage and ‘live’ along side the residents of the Maple Leaf SHARE shelter (hosted since 1996) for the week. The Meadowbrook Community Gardens and Orchards (MCGO) relies on large service groups throughout the seasons. 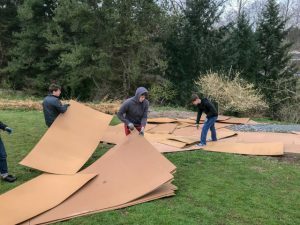 MCGO exists as a neighborhood stakeholder, volunteering weekly at the Seattle Parks site. Focusing on the site as an educational outdoor exhibit, inviting visitors to grow similar plants and trees in their own yards creates long term food security for the community. As a teaching location, it also highlights Seattle and efforts to be a sustaining and resilient community. 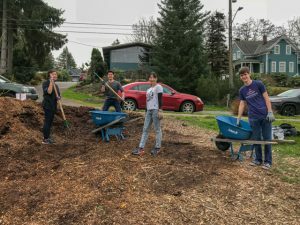 Many thanks to NE Seattle residents and seasonal volunteers to help with this long term project.